MISSISSAUGA, ON, March 21, 2019 /CNW/ - The Maple Leaf Foods Centre for Action on Food Security ("The Centre") commends the government on the initiatives and commitments contained within the 2019 budget that support the advancement of more sustainable and equitable food system. Through a five-year $134.4 million investment, the federal government will support local food infrastructure projects, a three-year immigration pilot to provide full-time jobs for non-seasonal agricultural workers and a path to permanent residency, and a North Isolated Community Fund to enhance food security in Canada's north. The government has also committed to working with provinces and territories to establish a much-needed national school food program. "We are encouraged to see the increased focus on advancing food security in Canada, with one in eight Canadian households living with food insecurity," said Michael McCain, Honorary Chairman of the Centre. "While this is a social issue that is widespread, it disproportionately affects women and children, First Nations and people of colour. This defies our national values and deprives people of the basic sustenance needed to live dignified and healthy lives." "We trust that the programs funded through the recently released budget signal that government is moving towards the completion of a comprehensive national food policy as described in the mandate letters for both the Ministers of Health and Agriculture and Agri-food. The commitments and initiatives included in the recently released budget will play an important role in making good food more accessible and affordable. As poverty is the primary driver of food insecurity, continued momentum against the government's goal of 50% reduction in poverty by 2030 is critical to addressing the shameful wide-spread issue of hunger in a country as wealthy as Canada." "The Centre is committed to working in partnership with government, civil society and the private sector to advance collaborative change so that good food is accessible for all Canadians," concluded Mr. McCain. 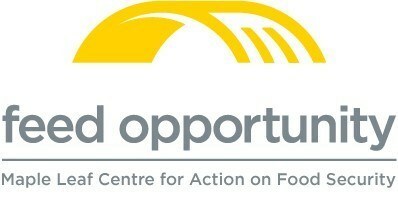 To engage with the Centre, follow us on Twitter @feedopportunity and like us on Facebook Facebook.com/FeedOpportunity. The Maple Leaf Centre for Action Food Security ("the Centre") is a registered charity that aims to advance sustainable food security and work collaboratively to reduce food insecurity in Canada by 50% by 2030. The Centre's areas of focus include advocacy, innovation and learning. The Centre partners with organizations that are testing and expanding innovative approaches to advance food security and supports networks, collaboration and research that builds further understanding of the issues and approaches that advance healthy, sustainable food for all Canadians.